Holy smoke: The New Yorker online! Thanks to a sidebar link on mistersugar, I now know that The New Yorker -- up until now possibly the most technologically backward major magazine in circulation -- has finally launched web site worthy of the label. I should explain that I am a longtime New Yorker reader -- fanatic, even. For the last few years the magazine has been virtually the only offline media I've touched. Its lack of sophistication on the web has bothered me, as much from a disgruntled marketing sense as for any other reason. Even before now there have been signs something was afoot. First they made available incredible DVDs containing the magazine's first 75 years with scanned page by page archives complete with the original advertisements. Then they updated the offering and bundled it all on a portable harddrive. That proved to me someone at the magazine was thinking about the big picture. Now, finally, a web site with an RSS Feed (look for it soon in the Salutor sidebar) and the promise of an upcoming inclusion of searchable archive. I am floored. 1) I am not only a New Yorker subscriber of fifteen years, but have volunteered my email address to them on more than one occasion. In the past, providing my email address to The New Yorker website has led, not to receiving stimulating New Yorker related material and advertisements, but to spam for other CondeNast publications like Glamour. Why on earth would they not, by mail or email, find some way to announce to me that they have a new website? 2) In my haste to test their new marketing smarts, I attempted to (re-)give the new New Yorker site my email address. 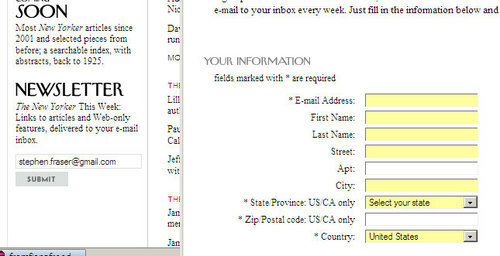 In the screenshot below, note that on the first page (left) of the site they offer a single form-field newsletter sign-up (note that this is an email marketing 'best practice'), but that when I fill it out and click enter I am taken to a second page (right) with a number of required fields -- one of which is MY BLANK EMAIL ADDRESS. My guess is that the smart web team designed the first page, and the imbeciles at CondeNast got the hand-off on the second page. Turning your popular blog into a book is happening more and more - and they've even got awards to prove it. Blooker prize honours best blogs. Any surviving readers of the blog that previously occupied this space will share my excitement at the announcement of the 2007 Shortlist for the Blooker Prize (the world's first literary prize for blooks, or books based on blogs). In nonfiction "My Secret," from the fascinating PostSecrets.com. In fiction "Monster Island," by David Wellington, a delegate of the Internet's lurching trend of zombie-related fiction (www.thirteenbullets.com). In comics, the laconic "Mom's Cancer," by Brian Fies from www.momscancer.com. The judges, chaired this year by the esteemed Paul Jones of iBiblio and including celebrity blogger Arianna Huffington, have a tough task before them picking an overall winner. What fun.